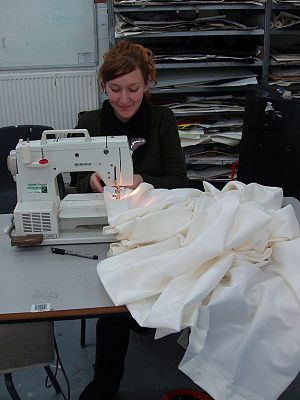 Using a modern sewing machine. Most sewing in the industrial world is done by machines known as sewing machines. Equipped with a complex set of gears and arms, each machine pierces thread through layers of cloth and interlocks the thread. The machine can be electrically or mechanically operated, but electric machines are far more common. The sewing machine produces results similar to hand sewing but at a much faster pace. It is used primarily to produce clothing and household furnishings such as curtains, bedclothes, upholstery, and table linens. It may also be used to stitch other flexible materials, such as canvas and leather. The invention and manufacture of the sewing machine has played an important role in the industrial revolution. On the one hand, it has saved countless hours of work and has greatly enhanced the quality of human life. On the other hand, sewing machines are also part of the history of exploitation of human labor, as people were forced to work at them for long hours at low wages. Sewing is an ancient art involving the stitching of cloth, leather, furs, or other materials, using needle and thread. Its use is nearly universal among human populations and dates back to Paleolithic times (30,000 B.C.E.). Sewing predates the weaving of cloth. Before the invention of a usable machine for sewing or dress design, everything was sewn by hand. Most early attempts tried to replicate this hand sewing method and were generally a failure. Some looked to embroidery where the needle was used to produce decorative, not joining stitches. This needle was altered to create a fine steel hook—called an agulha in Portugal and aguja in Spain. This was called a crochet in France and could be used to create a form of chain stitch. This was possible because when the needle was pushed partly through fabric and withdrawn, it left a loop of thread. The following stitch would pass through this first loop whilst creating a loop of its own for the next stitch, this resembled a chain—hence the name. The first known attempt at a mechanical device for sewing was by the German-born Charles Weisenthal, who was working in England. He was awarded British Patent No. 701 in 1755 for a double pointed needle with an eye at one end. This needle was designed to be passed through the cloth by a pair of mechanical fingers and grasped on the other side by a second pair. This method of recreating the hand sewing method suffered from the problem of the needle going right through the fabric, meaning the full length of the thread had to do so as well. The mechanical limitations meant that the thread had to be kept short, needing frequent stops to renew the supply. In 1790 British Patent No. 1764 was awarded to Thomas Saint, a cabinetmaker of London. Due to several other patents dealing with leather and products to treat leather, the patent was filed under "Glues & Varnishes" and was not discovered until 1873 by Newton Wilson. Wilson built a replica to the patent's specifications and it had to be heavily modified before the machine would stitch—suggesting that Saint never actually made a machine of his own. Saint's design had the overhead arm for the needle and a form of tensioning system, which was to become a common feature of later machines. There were various attempts and patents awarded for chain stitch machines of varying types from 1795-1830, none of which were used to any degree of success—many of which didn't work correctly at all. A French tailor Barthelemy Thimonnier made the next major breakthrough. He did not try to replicate the human hand stitch, looking instead for a way of finding a stitch that could be made quickly and easily by machine. His machine worked by using a horizontal arm mounted on a vertical reciprocating bar, the needle-bar projected from the end of the horizontal arm. The cloth was supported on a hollow, horizontal fixed arm, with a hole on the topside, which the needle projected through at the lowest part of its stroke. Inside the arm was a hook, which partly rotated at each stroke in order to wrap the thread (fed from the bobbin onto the hook) around the needle at each stroke. The needle then carried the thread back through the cloth with the upward motion of its stroke. This formed the chain stitch, which held the cloth together. The machine was powered by means of a foot pedal. The easiest way to describe this is to picture the machine working upside-down from how sewing machines are generally thought of today—the stitch was formed on the top of the cloth, not the bottom as with most other chain stitch machines made since. Thimonnier was awarded a French patent in 1830 and 80 of these machines were installed in a factory in Paris to stitch soldiers' clothing. Other tailors concerned for their livelihood invaded the factory and smashed the machines. Chain stitch has one major drawback—it is very weak and the stitch can easily be pulled apart. A stitch more suited to machine production was needed, it was found in the lock stitch. A lock stitch is created by two separate threads interlocking through the two layers of fabric, resulting in a stitch that looks the same from both sides of the fabric. 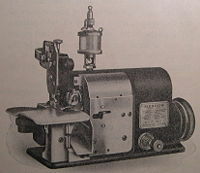 Although the credit for the lock stitch machine is generally given to Elias Howe, Walter Hunt developed it first over ten years before, in 1834. His machine used an eye-pointed needle (with the eye and the point on the same end) carrying the upper thread, and a shuttle carrying the lower thread. The curved needle moved through the fabric horizontally, leaving the loop as it withdrew. The shuttle passed through the loop, interlocking the thread. The feed let the machine down—requiring the machine to be stopped frequently to set up again. Hunt grew bored with his machine and sold it without bothering to patent it. Elias Howe patented his machine in 1846; using a similar method to Hunt's, except the fabric was held vertically. The major improvement he made was to put a groove in the needle running away from the point, starting from the eye. After a lengthy stint in England trying to attract interest in his machine he returned to America to find various people infringing his patent. He eventually won his case in 1854 and was awarded the right to claim royalties from the manufacturers using ideas covered by his patent. Isaac Merritt Singer has become synonymous with the sewing machine. Trained as an engineer, he saw a rotary sewing machine being repaired in a Boston shop. He thought it to be clumsy and promptly set out to design a better one. His machine used a flying shuttle instead of a rotary one; the needle was mounted vertically and included a presser foot to hold the cloth in place. It had a fixed arm to hold the needle and included a basic tensioning system. This machine combined elements of Thimonnier’s, Hunt's, and Howe’s machines. He was granted an American patent in 1851 and it was suggested he patent the foot pedal (or treadle) used to power some of his machines; however, it had been in use for too long for a patent to be issued. When Howe learned of Singer’s machine he took him to court. Howe won and Singer was forced to pay a lump sum for all machines already produced. 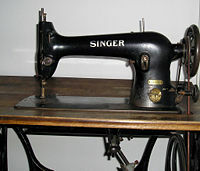 Singer then took out a license under Howe’s patent and paid him $15 per machine. Singer then entered a joint partnership with a lawyer named Edward Clark, and they formed the first hire-purchase (time payment) scheme to allow people to afford to buy their machines. Meanwhile Allen Wilson had developed a reciprocating shuttle, which was an improvement over Singer’s and Howe’s. However, John Bradshaw had patented a similar device and was threatening to sue. Wilson decided to change track and try a new method. He went into partnership with Nathaniel Wheeler to produce a machine with a rotary hook instead of a shuttle. This was far quieter and smoother than the other methods, and the Wheeler and Wilson Company produced more machines in 1850s and 1860s than any other manufacturer. Wilson also invented the four-motion feed mechanism; this is still seen on every machine today. This had a forward, down, back, and up motion, which drew the cloth through in an even and smooth motion. Through the 1850s more and more companies were being formed and were trying to sue each other. Charles Miller patented the first machine to stitch buttonholes (US10609). In 1856 the Sewing Machine Combination was formed, consisting of Singer, Howe, Wheeler and Wilson, and Grover and Baker. These four companies pooled their patents, meaning that all the other manufacturers had to obtain a license and pay $15 per machine. This lasted until 1877 when the last patent expired. In 1822 J. Makens Merrow purchased a powder mill in Mansfield, Connecticut for the manufacture of gunpowder. The mill was destroyed shortly thereafter by a gunpowder explosion. J.M. Merrow then founded one of the first knitting mills in the United States in partnership with his son, Joseph B. Merrow, under the name J. M. Merrow and Son. This knitting mill was located on the site of the old gunpowder mill in Mansfield, Connecticut. In the 1840s a machine shop was established at the Merrow mill to develop specialized machinery for the knitting operations. And in 1877 the world’s first crochet machine was invented and patented by Joseph M. Merrow, then-president of the company. The crochet machine was the first production overlock sewing machine. 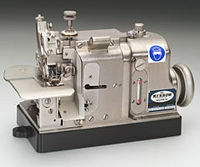 The Merrow Machine Company went on to become one of the largest American Manufacturers of overlock sewing machines, and continues to be a global presence in the twenty first century as the last American Overlock Sewing Machine manufacturer. James Edward Allen Gibbs (1829-1902), a farmer from Raphine in Rockbridge County, Virginia patented the first chain-stitch single-thread sewing machine on June 2, 1857. 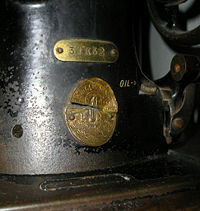 In partnership with James Wilcox, Gibbs became a principal in Wilcox & Gibbs Sewing Machine Company. Wilcox & Gibbs commercial sewing machines are still used in the twenty-first century. In 1905 Merrow won a lawsuit against Wilcox & Gibbs for the rights to the original crochet stitch. An overlock stitch sews over the edge of one or two pieces of cloth for edging, hemming or seaming. Usually an overlock sewing machine will cut the edges of the cloth as they are fed through. Such machines are called "sergers." Some overlock sewing machines are made without cutters. The inclusion of automated cutters allows overlock machines to create finished seams easily and quickly. 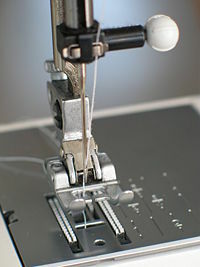 An overlock sewing machine differs from a lockstitch sewing machine in that it utilizes loopers fed by multiple thread cones rather than a bobbin. Loopers serve to create thread loops that pass from the needle thread to the edges of the fabric so that the edges of the fabric are contained within the seam. Overlock sewing machines usually run at high speeds, from 1000 to 9000 revolutions per minute (rpm), and most are used in industrial setting for edging, hemming and seaming a variety of fabrics and products. Overlock stitches are extremely versatile, as they can be used for decoration, reinforcement, or construction. Overlocking is also referred to as “overedging,” “merrowing” or “serging.” Though “serging” technically refers to overlocking with cutters, in practice the four terms are used interchangeably. The usage of sewing machines has grown over the years and has outpaced sewing by hand. Modern machines may be computer controlled and use stepper motors or sequential cams to achieve very complex patterns. Most of these are now made in Asia and the market is becoming more specialized, as fewer families own a sewing machine. This page was last modified on 9 September 2015, at 15:46.